You’d think historical data would show that a fast and furious Fed tightening regime would be yield worse performance for the stock market than the ‘slow and measured’ approach the Fed is advertising now. Not so. Today, we are sitting at the outperformance peak for the slow cycles. So if you accept that the current slow tightening cycle plays out like previous ones, then the stock market is about to drift lower in the coming year. I would have thought the best development for the stock market would have been an economic pause that allows the Fed to slow down their hikes. Yet this data suggests that what we really should hope for is a rip-roaring economy that causes the Fed to tighten quickly. 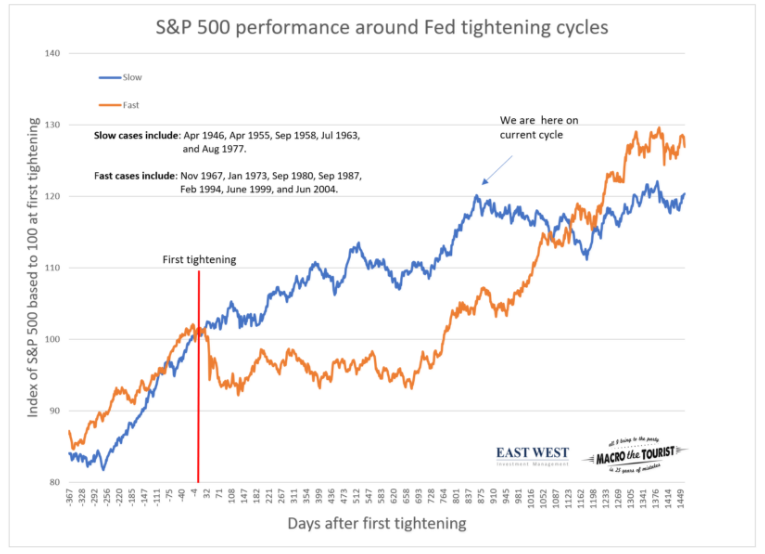 There is no doubt that this cycle is different due to QE and other unusual factors, but history suggests it might be time to temper the enthusiasm as the slow cycle rally is about all played out.